Born in Calgary, AB and raised in Brampton, ON, this high school music teacher is very active in her community and keeps busy through her many musical involvements, fitness activities and enjoying family and friends. Nancy and her husband Jeff now live in the Hamilton area with their four children (Cecilia, Stephen, Jack and Nathan). 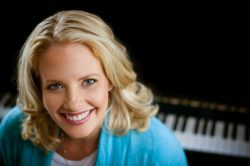 Nancy Bodsworth began her music career at a very young age by singing in a local church choir and taking piano lessons. Knowing that music was in her blood, Nancy attended a prestigious high school for the performing arts where she studied vocal music through a variety of genres (jazz, musical theatre, and classical). Nancy now holds bachelor degrees in both Vocal Music and Education from the University of Western Ontario and now teaches vocal music with the Dufferin-Peel Catholic District School Board. Until recently, Nancy directed the Youth Choir St. Anthony of Padua Parish in Brampton, ON for about 13 years and now cantors periodically at her new parish, St. Thomas the Apostle in Waterdown, ON. She continues to direct the choirs at her school in Mississauga, frequently sings and plays keyboard at weddings, conferences, retreats, rallies and various school board-related functions. Nancy has performed on EWTN’s “Dana and Friends” and her song “In My Father’s House” was also nominated for a GMA Covenant Award in 2013. Nancy and her family have also been very blessed to provide the music for some of the CTV Sunday morning masses for the past five years. 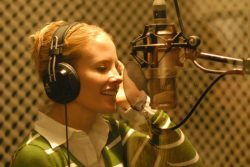 Despite spending most of her time taking care of her four young children, Nancy continues to write and record new Christian music. All of her albums – Embrace (2007), My Everything (2013) and Let Your Mercy Fall (2016) are available on this site! Nancy’s next goal is to record a Christmas album – stay tuned!